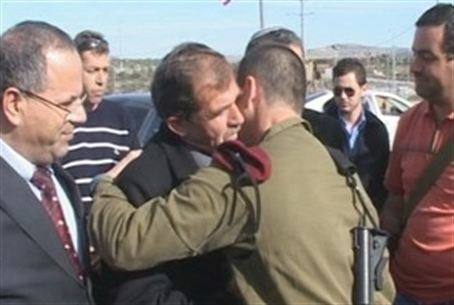 Druze and Jews pay their respects to fallen soldier. MK Kara calls to build a new Samaria town in his name. Hundreds of soldiers, Druze from the town of Marar, and Israeli Jews living in Samaria gathered Tuesday at the Tapuach junction to pay their respects to slain IDF soldier Ihab Khatib. The terrorist attack in which Khatib was killed took place at the junction one year earlier. A memorial was unveiled during the ceremony. Afterwards, members of the Khatib family planted trees nearby, in Ihab's memory. Residents of Samaria have been in touch with the Khatib family since shortly after the attack. Samaria Regional Council head Gershon Mesika paid a condolence call to the family last year, along with Minister for the Development of the Negev and Galilee Ayoub Kara. Kara spoke at the ceremony about the close ties between Jews and the Druze community. “The connection between the people of Israel and the Druze community has been strong since early history, and unfortunately, we also share a blood covenant. The brave soldier Ihab Khatib did not fall as a Druze soldier, but as a soldier equal to any other, a fallen IDF soldier, a hero of the Israeli forces,” he said. “I hope to see all of you soon at the ceremony in which a cornerstone is laid for the new town in his memory,” Kara concluded.